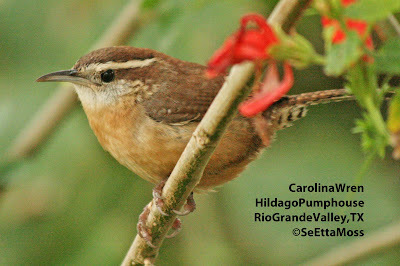 I photographed this Carolina Wren at Hildago Pumphouse (where they used to pump water from the Rio Grande River for many farm fields). 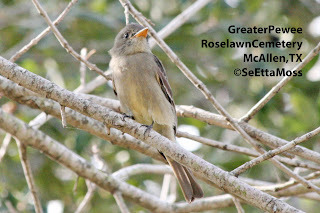 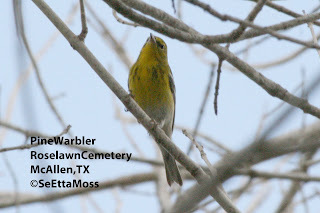 South of the McAllen,TX, this location is adjacent to the Rio Grande River and just across the border from Mexico. 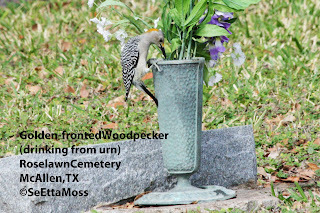 This cemetery was exceptionally birdy including a female Summer Tanager that only allowed quick looks and no pics. 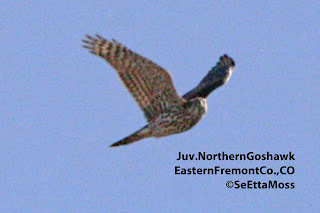 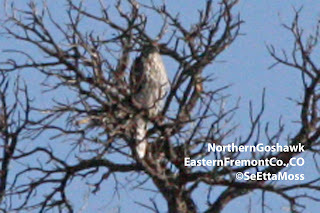 Soon the juvenile Northern Goshawk was flushed by the bird mobbing it and I caught these pics as it flew past me. 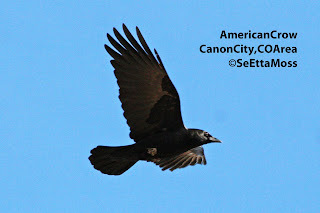 These American Crows were part of a large flock of about 125-150 that I found just east of Canon City, CO today. 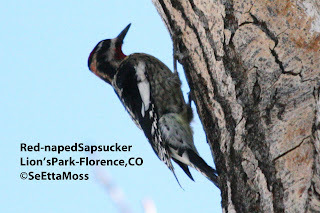 Many of them were on a gravel bar in the Arkansas River where they could get a long drink of water and a refreshing bath--both harder to come by in this area due to moderate drought conditions. 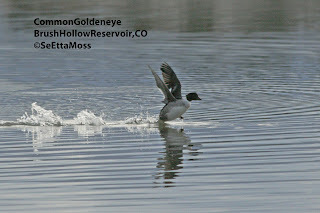 I photographed this female Common Goldeneye today at Brush Hollow Reservoir northeast of Canon City, CO.
(Washington, D.C., December 8, 2010) A new, peer-reviewed study report titled, Feral Cats and Their Management from the University of Nebraska—Lincoln, has put the annual economic loss from feral cat predation on birds in the United States at $17 billion. 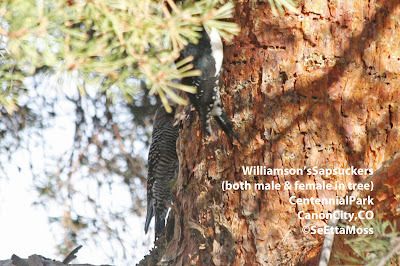 The report analyzes existing research on management of the burgeoning feral cat population – over 60 million and counting -- in the United States, including the controversial practice of Trap, Neuter, Release (TNR). 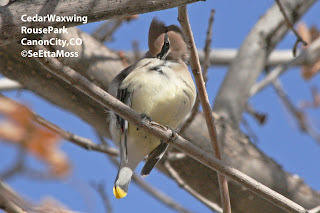 While continuing my surveys of wintering sapsuckers in the Canon City, CO area I took a few minutes to enjoy a small flock of Cedar Waxings feeding in hackberry tree in Rouse Park. 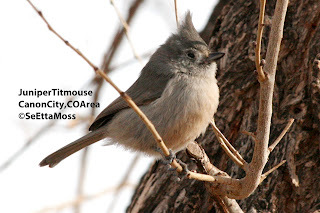 The Juniper Titmice in the previous two posts and the one below are located in trees in the dry gulch near Canon City where I have been following the Williamson's Sapsuckers (that are not feeding in the pines in the urban area of town). 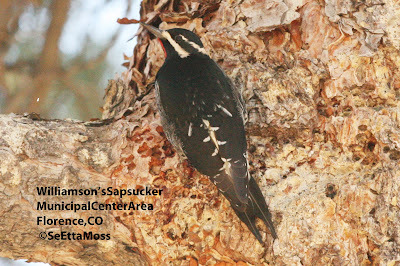 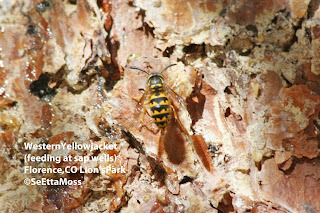 They fly in from the surrounding juniper woodlands and flit around in not only the siberian-type (non-native) elms in the gulch but in the tamarisk that are also in the gulch (which is obviously not dry all the time). 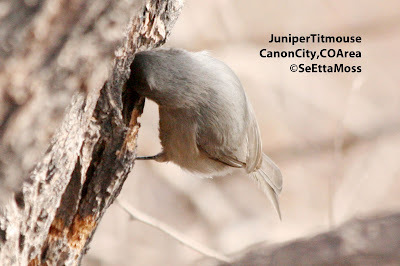 The titmouse in the top pic has it's bill poked into a sap well. 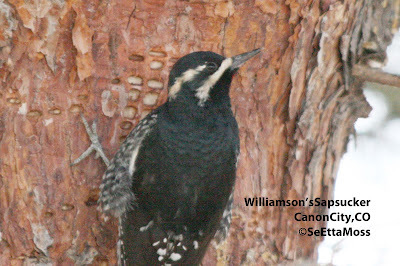 Also feeding at the sap wells drilled by the sapsuckers in these elms are Mountain Chickadees including the one in the middle and bottom pics. 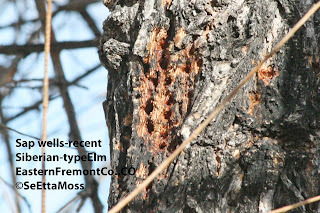 Note the whitish object in the mouth of the chickadee in the bottom pic--it looks like a grain of rice but I think it may be a insect larva, possibly a bark beetle larva or eggs? 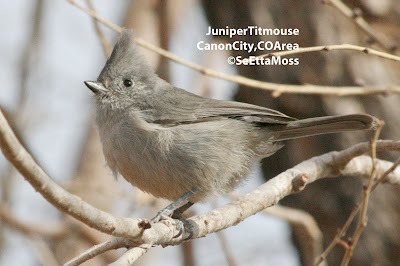 These Juniper Titmice are busy little birds, flitting about, making it a challenge to get a photo that is not blurred by their rapid movements. 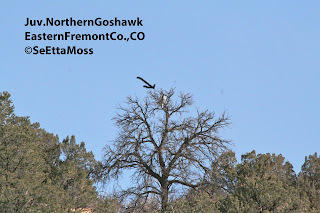 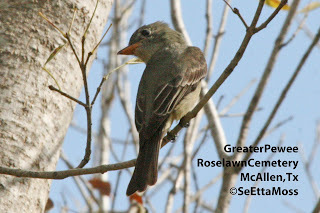 I caught one of the titmice as it plucked what appears to be a bud off this siberian-type elm tree (this and other non-native elms have many 'buds' still on their branches, possibly due to the unseasonable warm temps we have had in Colorado this fall--including a high of 70 two days ago).